Ok, this is going to sound really silly but in all my sock knitting I”ve never made a plain pair socks. 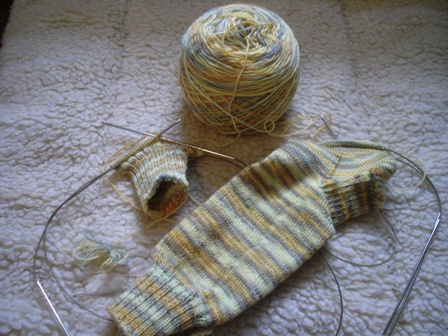 I always include all over ribbing or a cable or lace or something but never just a plain ol’ sock…. What the hell took me so long…?! B) It’s beloved stockinette….round, after round, after mind-calming round of knit stitches. Well, this gorgeous pair are for my best friend May…a while back she very sweetly voiced her “awareness” that to date she has never received a pair of socks from me, that my sister gets them all. Well May-May, here they are. 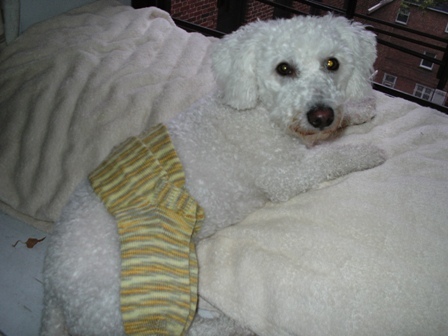 Wear them in good health my friend….love ya honey. I do have to admit parting with these will be a bit hard….they are so soft and yummy…I love them. That’s one of my pups, Scooby who graciously agreed to model them. Chris and I adopted him and his brother Chance (pictures later, he was feeling a bit camera shy today) last November…Lots more pics of them to come…. Color: The skein came from a potluck bag…no name included. 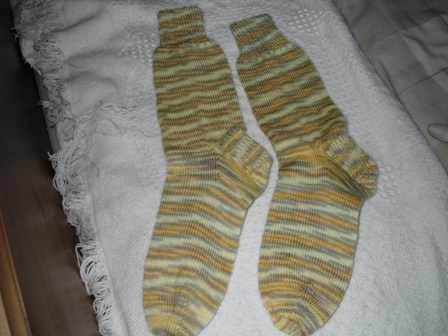 Thoughts: As you can see above my cure for Second Sock Syndrome (SSS), do them both at the same time….. I never knit plain socks either. I like ’em fancy. For plain stockinette I knit hats. Thank you, thank you, thank you for my beautiful socks! I got them in the mail yesterday and was tempted to lower the AC in the house to 65 so that I could wear them all day long. I had to eventually take them off once my feet started to sweat!! I LOVE them!!!!! The color and the fit are PERFECT!! You’re the best! !